Geometry lies at the core of every design process, and as computer-aided design becomes more common, the patterns that can be found in architecture, furniture and home decor grow increasingly complex. The use of fractal geometry, in which a geometric pattern is repeated at smaller and smaller scales to produce irregular shapes and surfaces, is among the most visually interesting. 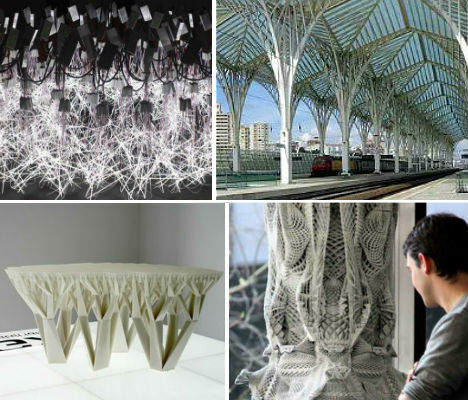 Here are 12 fractal (and fractal-inspired) designs, from tables to the canopy over a train station. Mimicking fractal growth patterns found in nature, the Fractal Table by Platform Wertel Oberfell features legs that resemble tree trunks that divide over and over again until they’re dense enough to form a patterned surface. These columns are so complex, at first they don’t seem as if they could possibly be real. 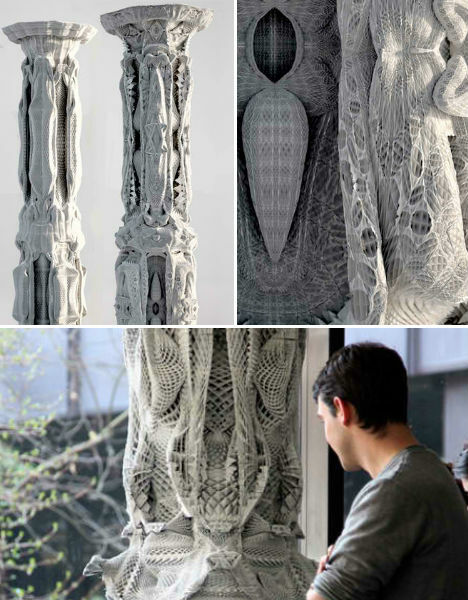 Michael Hansmeyer first designed his ‘ornamented columns’ using algorithms and subdivision processes that result in incredibly varied topographies. 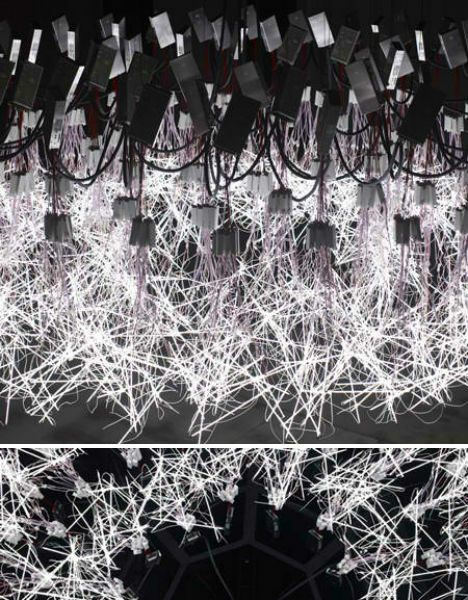 The designs were then created in three dimensions using 1mm grey board sheets that were individually cut using a mill or laser, then stacked together on poles that run through the core. 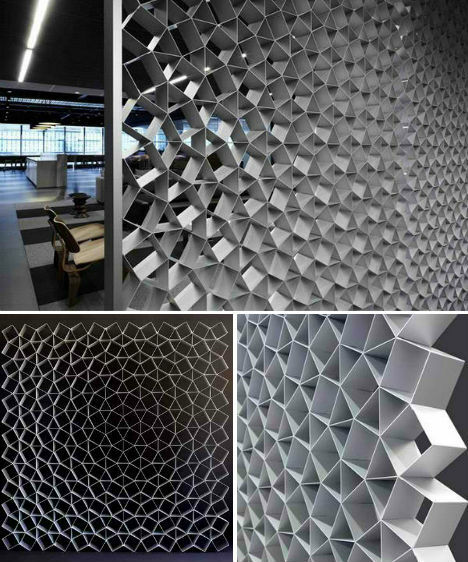 Made of anodized aluminum, this room screen by Korban/Flaubert takes its inspiration from the fractal shapes of honeycomb. 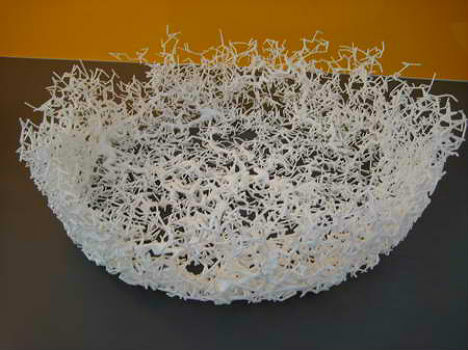 These unusual vessels were created by digitally fabricating the fractal growth patterns of natural phenomena like lightning and snowflakes through a process called ‘Diffusion Limited Aggregation’. 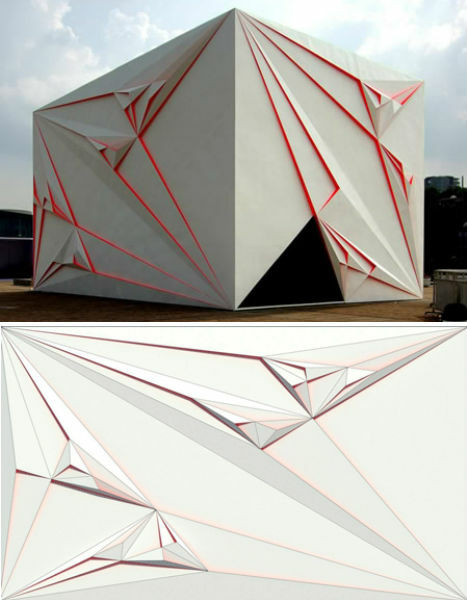 Architecture firm HHD_FUN created a pavilion in Beijing that features a pattern based upon a triangular fractal pattern. 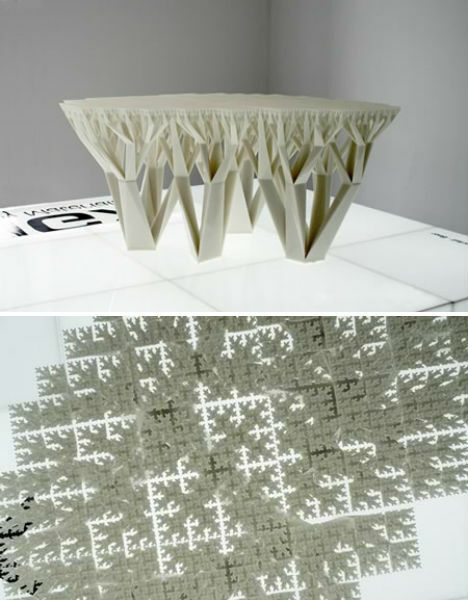 The faces of the pavilion were designed using a recursion algorithm, sub-dividing or ‘cracking’ each triangle into smaller and smaller triangles. 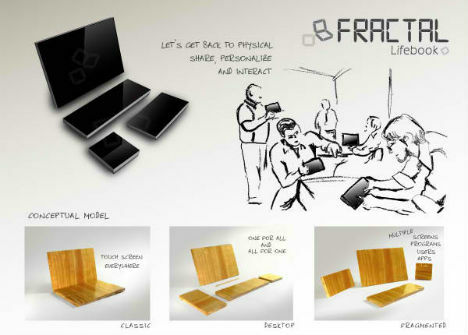 At each ‘cracking’, new triangles are raised from the surface to create a three-dimensional pattern. 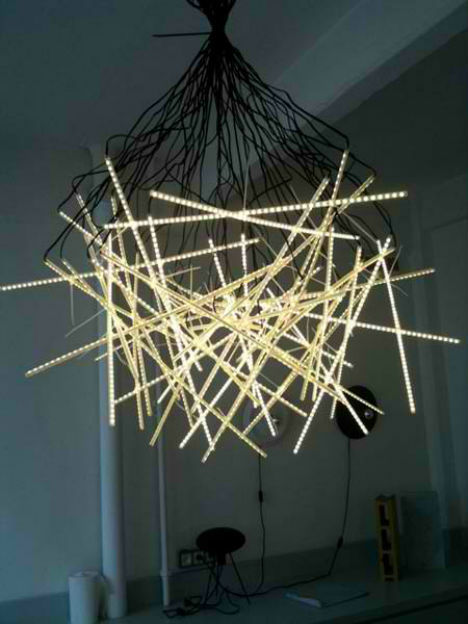 Arik Levy also completed this ‘Fractal LED’, another in his fractal LED light series. 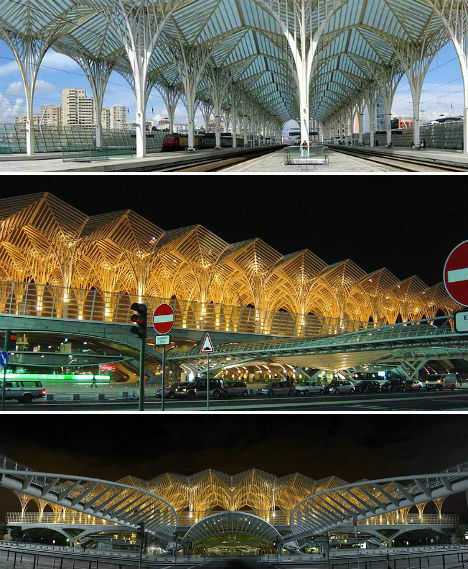 Lisbon’s Oriente Station by Santiago Calatrava is a dazzling example of mathematically inspired architecture. 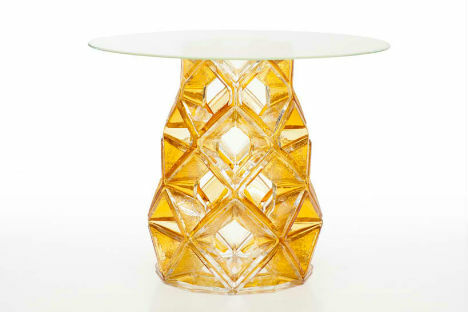 Calatrava is known for designs that are often rooted in natural patterns and forms, particularly sea life and birds. 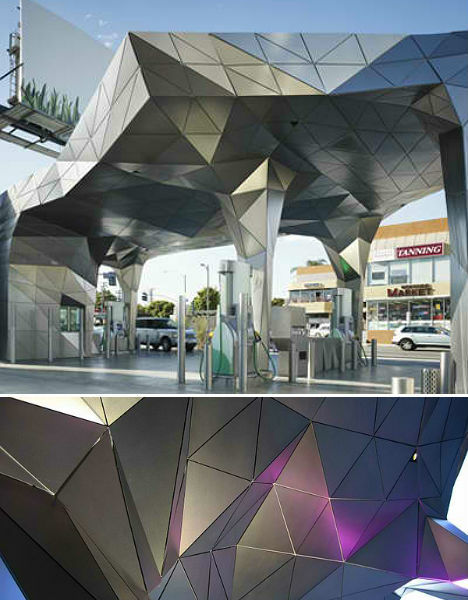 Its design may not technically be fractal, but the Helios House gas station in Los Angeles definitely has the look of a mathematical pattern to it, with its faceted stainless steel facade. 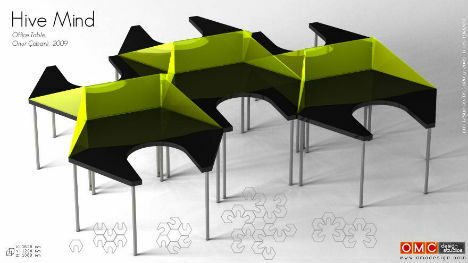 Offering more privacy and adaptability, and certainly better looks, the ‘Hive Mind’ office desk system is an alternative to conventional cubicles that can create fractal working spaces in various configurations.